The S-Martha class canal boats. There is full radiator central heating on the boat. A 200 gallon water tank supplies the hot and cold running water. There is carpeting in the saloon and bedrooms. 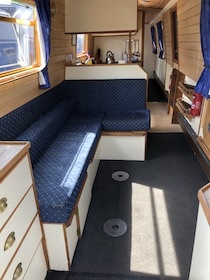 Saloon with sofa and removable table , in the bow of the boat. Radio/CD player; colour TV/DVD player. 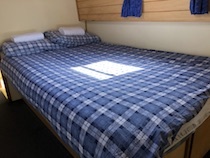 There is one bathroom with a wash hand basin, electrically operated flush toilet and shower and a 240v shaver socket, and separate toilet and hand basin. 12v mobile phone charging point (please remember to bring your own car charging lead). 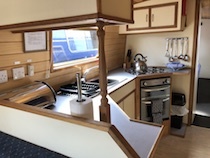 USB charging point also.The 2kw inverter supplies 240v electricity to certain appliances and to a socket on the boat. (Please note: if you decide to use any of your own electrical appliances, you do so at your own risk).